The Suwannee River Water Management District is a Cooperating Technical Partner (CTP) working to implement the Federal Emergency Management Agency’s (FEMA) Risk MAP Plan. e) Improving customer service to speed processing of flood map orders and raise public awareness of flood hazards. Risk MAP provides high quality flood maps and information, tools to better assess the risk from flooding and planning and outreach support to communities to help them take action to reduce (or mitigate) flood risk. Each Risk MAP flood risk project is tailored to the needs of each community and may involve different products and services. 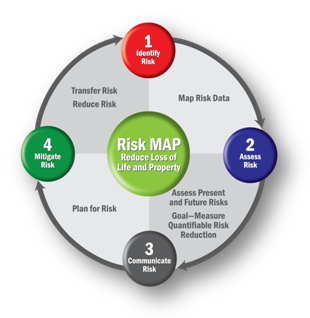 Learn more about the goals and long term vision of Risk MAP. To find more floodmapping resources, visit our Map Resources web page.